John Fea's article explores the meaning of the Enlightenment for ordinary Americans in the eighteenth century. This installment of "Teaching the JAH" focuses on the life of Philip Vickers Fithian, one of the century's most prolific diarists, to help students locate the Enlightenment historically in a distinctively American place. Fea suggests that cosmopolitan ideas about how to make a better self or a better life always arise in specific local contexts and are often connected with religion and passion for home. The pages that follow includes not only substantial selections from Fithian's diary and letters but also excerpts from other writers and reproductions of paintings and published illustrations, including images of Fithian's hometown in New Jersey. 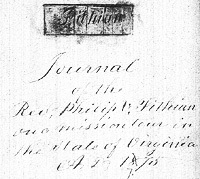 This installment features transcripts and images for over 300 pages from the papers of Philip Vickers Fithian, including letters and journal entries. These pages include complete transcripts and images for all the related sources in the article, those used in the exercises, and some additional sources. Access this resource by following links within the article, the exercises, or the chronological index. You may use the "Sections" menu on the upper right-side of each page to navigate through this installment. Provided below is a summary of each section in this installment. The full-text of the article as it appeared in the September 2003 issue of the Journal of American History. The author's comments about using his article in the classroom. A set of primary source documents and images selected for use in teaching this article. A bibliography of related secondary sources recommended by the author. A list of links to related Web sites.